The internet functions as the master machine controlling human brain function creating a netocratic society and state. The internet exposure leads to low level EMF fields, formation of supramolecular porphyrions and nanoarchaeal abiogenesis. The nanoarchaea contain magnetite and are magnetotactic and can have quantal perception as well as low level EMF perception. This leads to more of brain endosymbiotic nanoarchaeal growth. The nanoarchaea are capable of methanogenesis which contributes to global warming and further endosymbiotic archaeal symbiosis. 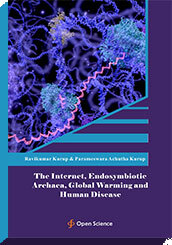 The internet exposure related increased endosymbiotic archaeal growth leads to disease states in humans. The endosymbiotic archaea catabolises cholesterol and leads to a cholesterol depletion syndrome. The deficiency of vitamin D leads to widespread infection. Vitamin D deficiency and bile acid deficiency can lead to metabolic syndrome X, diabetes mellitus, stroke and coronary artery disease. The endosymbiotic archaea can induce the Warburg phenotype producing cancer and autoimmune disease. The cholesterol depletion can lead to neuronal death and neurodegeneration. The frontal atrophy and cerebellar dominance can lead to schizophrenia and autism. Thus the internet exposure related increased endosymbiotic archaeal growth can lead to civilizational diseases like neurodegeneration, schizophrenia, autism, metabolic syndrome and autoimmunity.